This bio is based on biographic information on Gregorio Prieto and his friends and contemporaries, on the documentation held in the Gregorio Prieto Foundation’s library and archives and on the work of Vicente Nello, manager of the Gregorio Prieto Foundation, published in 1997in the catalogue Gregorio Prieto y las vanguardias (Gregorio Prieto and the avant-garde). VALDEPEÑAS AND MADRID: THE EARLY YEARS. On 2 May 1897 Gregorio Prieto Muñoz, was born in Valdepeñas, Ciudad Real, to Ildefonso Prieto, a carpenter, and Froilana Muñoz, who would die two years later. In 1900 Prieto’s father married Tadea Solance and opened a business, “El Bazar Español”, on the ground floor of the family home. Towards 1905 the family moved to Madrid, where Prieto’s father opened a cabinetry workshop. Gregorio Prieto discovered his passion for painting very young, and had to hide it from his disapproving father. He studied engineering for three years at Madrid’s Escuela Industrial. He did not do well in his studies and went on to work in various trades with equally disappointing results, all the while secretly preparing for the entry exam for Madrid’s Real Academia de Bellas Artes de San Fernando. In 1915 he passed the exam and was offered a place, which convinced his reluctant father to allow him to study painting. He began his degree in Fine Arts the same year. His teachers included Ramón del Valle Inclán and Julio Romero de Torres and he soon became friends with his classmates Rosa Chacel, at that time a sculpture student, Timoteo Pérez Rubio, José Frau and Joaquín Valverde. MADRID: FIRST EHIBITIONS. FRIENDSHIP WITH YOUNG POETS. In 1919 Prieto held his first solo show at the Ateneo de Madrid and attracted positive attention from critics. Through this exhibition he met Daniel Vázquez-Díaz, who had recently arrived from Paris. In 1920 he exhibited at the Ateneo de Bilbao, where he met the painter Aurelio Arteta. He also participated in various joint exhibitions in 1920, and was awarded a study grant by the Ciudad Real Provincial Council. He held further exhibitions in 1921 and 1922 and met the artist Jesús Olasagasti, who painted a portrait of him. He also exhibited his work in Barcelona, and was awarded the third medal in the Spanish National Fine Arts Exhibition. Towards 1922, he met Rafael Alberti, which was the beginning of a close, lifelong friendship. At that time, Rafael Alberti was a young painter whose interest in painting was dwindling as his passion for poetry grew. Gregorio Prieto painted two portraits of Alberti. In 1924 Prieto exhibited his work in the Museum of Modern Art, and Enrique Díez-Canedo wrote a presentation in the exhibition catalogue. It was at this exhibition that he met Federico García Lorca, which whom he would become great friends. Prieto paid frequent visits to García Lorca, who lived in the students’ halls of residence, and there he met Juan Ramón Jiménez and Emilio Prados, among others. Over these years he met many of the people who would go on to become his closest friends, including Vicente Aleixandre, Concha Méndez, María Zambrano and Concha de Albornoz. At the home of Concha de Albornoz, he met Luis Cernuda. He also knew Juan Chabás, Ernesto Giménez Caballero, José Bergamín, Manuel Altolaguirre and Maruja Mallo. The Committee for Extension of Studies awarded Prieto a grant to study painting in Europe for three years. He moved to France, to study at the Colegio de España in Paris. In Paris he met Alfonso Reyes, the then Mexican Ambassador in France, he accompanied Miguel de Unamuno on a trip to the city, he met José María Hinojosa, whose portrait he painted, and he spent time with Spanish painters including Francisco Bores, José María Ucelay, who painted his portrait, Pancho Cossío, Manuel Ángeles Ortiz and Joaquín Torres García. He also became friends with the French poets Jean Cocteau, André Bretón, Max Jacob, Paul Valéry and Jean Cassou, and the Italian painter Filippo de Pissis. Upon his return to Madrid, Prieto was awarded a study grant from the Academia de España in Rome, and set off to spend four years in Italy. Before leaving for Rome he held an exhibition, organised by Spain’s Friends of the Arts Society (Sociedad de Amigos del Arte). The exhibition catalogue featured introductions by his friends Vicente Aleixandre and Rafael Alberti. A leaving banquet was held in homage to Prieto, attended by Federico García Lorca, Vicente Aleixandre, Dámaso Alonso, Concha Méndez, Jesús Olasagasti, Joaquín Valverde, Daniel Vázquez-Díaz, Victorio Macho, Francisco Ayala and Enrique Díez-Canedo, among others. Once he was settled in Rome, he resumed contact with his friend Filippo de Pissi, who is very likely to have introduced him to Rome’s art scene. There he met F. T. Marinetti, Bragaglia, Carlo Carrá, Giorgio de Chirico, Corrado Cagli, who painted his portrait, F. Longhi and the writers Alberto de Moravia and Margherita Sarfatti. 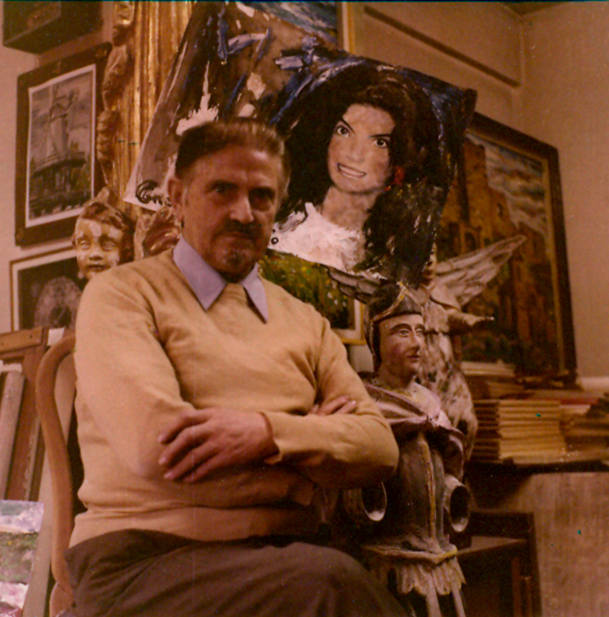 He travelled broadly in southern Italy over these years, visiting Naples, Palermo, Taormina and Capri, where he met and painted a portrait of Greta Garbo. He exhibited his work at the Rome Art Association – Alfonso Reyes dedicated a poem to him in the exhibition catalogue – as well as in Milan and the Casa d’Arte Bragaglia in Rome. In 1931, Ramón del Valle-Inclán was appointed director of the Academia de España in Rome. Around this time, Prieto met Eduardo Chicharro at the Academia de España, giving rise to a great friendship and an intense joint project which would result, among other creations, in a spectacular series of photographic portraits. He travelled around Greece and its islands, and exhibited in Athens. The poet Kostis Palamas, who at that time was President of the Spanish-Greek Association, wrote about Prieto’s paintings in the local press. Prieto returned briefly to Spain. He then moved to Paris, but continued to travel around Europe, holding a number of exhibitions during these years: Berlin, Copenhagen, Oslo and Athens. 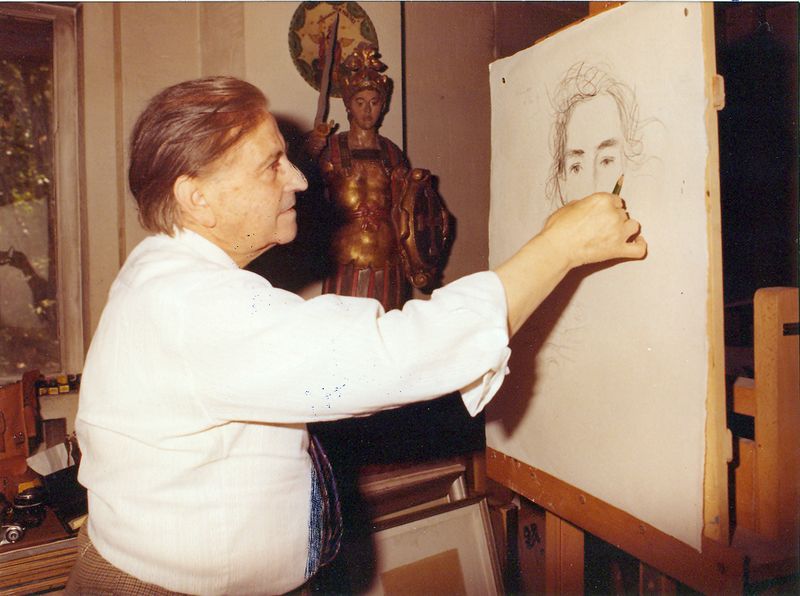 He met Manuel Altolaguirre in Paris in 1931 and painted his portrait twice. Altolaguirre printed his book of drawings, Cuerpos (Bodies). He travelled to Egypt and exhibited in Cairo. Prieto donated two oil paintings to Madrid’s Museum of Modern Art – Caballo de Bronce (Bronze Horse) and Ruinas de Taormina (Taormina Ruins) – in appreciation of the grant for his stay in Rome. The Jeu de Paume Museum in Paris bought his oil painting Hombre y Caballo (Man and Horse). 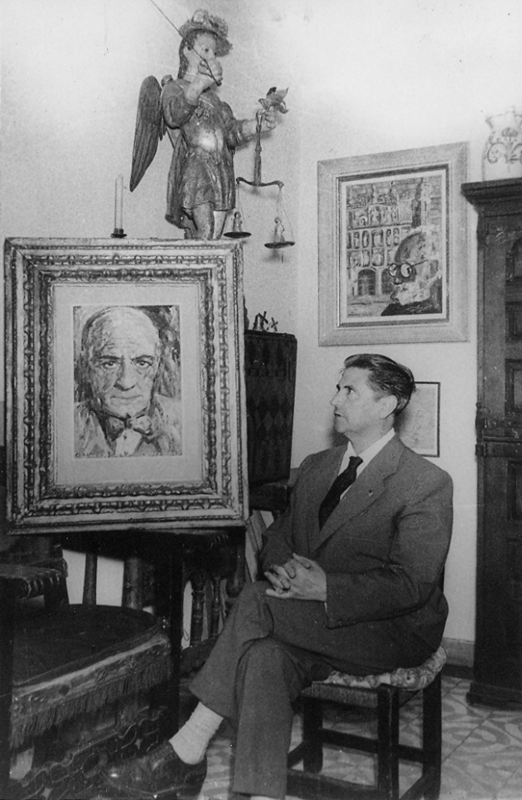 In 1935, at a joint exhibition of modern Spanish painters, Prieto met Pablo Picasso. He travelled to England that same year and met up with his friends Concha Méndez and Manuel Altolaguirre, who were married by that time. He moved temporarily to England, where he lived in Oxford and Cambridge. In 1936 he published a portfolio of drawings called An English Garden, featuring a poem by Ramón Pérez de Ayala, who at that time was the Ambassador of the Spanish Republic in London. Prieto returned to Madrid to present an exhibition of his drawings at the National Museum of Modern Art. He was caught unawares by the outbreak of the Civil War, and was able to leave Spain thanks to his status as a British resident. He exhibited his oil Luna de Miel en Taormina (Honeymoon in Taormina) in the Spanish Pavilion at the International Exhibition in Paris. He moved to London and in these early, cash-strapped years, lived in Rafael Martínez-Nadal’s home with Luis Cernuda. 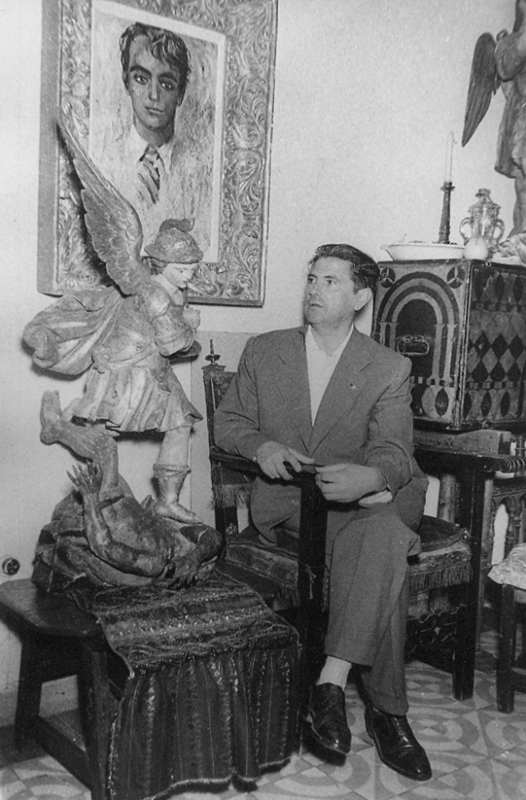 In 1939, he designed the set for a performance of García Lorca’s La Zapatera Prodigiosa (The Shoemaker’s Prodigious Wife) at King’s College. During World War II he split his time between Oxford and London, working on the BBC radio show run by Martínez Nadal and lecturing in London, Liverpool, Oxford and Sheffield. He also published the collection of drawings Estudiantes (Students). In 1945, Luis Cernuda, who was working for the Spanish Institute in London, went to live in Prieto’s house, where he would remain until leaving for America in 1947. He began his series of drawings on Shakespeare’s Sonnets and John Milton’s Paradise Lost. In late 1947 he returned temporarily to Spain at the invitation of Walter Starkie, director of the British Institute in Madrid, to hold a series of exhibitions of his drawings. RETURN TO SPAIN. THE VALDEPEÑAS MUSEUMS. Prieto inaugurated the exhibition of his drawings of the Sonnets, Paradise Lost, An English Garden, the Students collection from Oxford and Cambridge and his various portraits of his poet friends at the British Institute in Madrid. After the exhibition ended, a dinner was held in his honour by his friends the Duke of Alba, Vicente Aleixandre, Enrique Azcoaga, Gerardo Diego, Edgar Neville, Adriano del Valle, Leopoldo Panero, Enrique Lafuente Ferrari, Gregorio Marañón, José Camón Aznar and José María Cossío, among others. The travelling exhibition held at the various branches of the British Institute around Spain was a success, and was inaugurated in Barcelona, Seville and Gibraltar. Valdepeñas made Prieto an “Hijo Predilecto” (Honoured Citizen) and offered him the opportunity to build a windmill-museum, an opportunity he was delighted to accept. On 13 November 1982, the windmill-museum, Museo de los Molinos, was opened in Valdepeñas. In May 1987, the first phase of the Gregorio Prieto Foundation Museum was inaugurated, and Prieto’s friends Rosa Chacel and José Hierro spoke at the ceremony. In 1988, Prieto suffered a fall and broke his hip, confining him to a wheelchair in the final years of his life. On 19 February 1990, King Juan Carlos I of Spain inaugurated the Gregorio Prieto Foundation Museum. Also in 1990, Prieto was awarded the Gold Medal of Castilla-La Mancha and was named an Honorary Academic by the Real Academia de Bellas Artes de San Fernando. Gregorio Prieto died in Valdepeñas on 14 November 1992, at the age of 95.